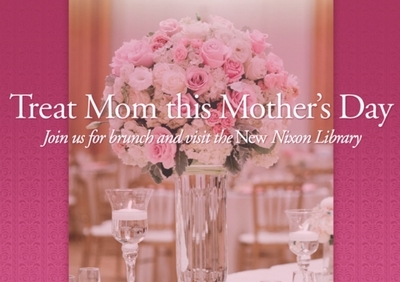 Give your mom an unforgettable experience by joining us for a lavish brunch in our stunning replica of the historic White House East Room. You will be welcomed by a presidential red carpet arrival and complimentary red rose for your mom, followed by live musical entertainment and dining under our three magnificent crystal chandeliers. Menu includes an abundant buffet brunch of Baja Cali Shrimp cocktail, tequila and lime cured salmon, Applewood smoked chicken apple sausage, chef carved tenderloin of beef, salmon medallions, cheese omelets, Belgian waffles, basmati rice, grilled Mediterranean vegetables and a sweets station. 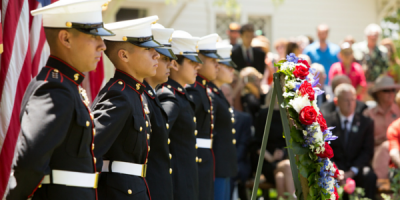 To complete this memorable experience, you receive admission to the Nixon Library’s new museum, featuring more than 70 exhibits and interactives. You can also tour First Lady’s vibrant Rose Gardens, the President’s charming childhood home, serene memorial sites of President and Mrs. Nixon, and impressive Marine One Helicopter. Reserved seating for groups of 6-10. Groups of less than six will be seated with other parties. Two seatings: 9:30 a.m. and 12:00 p.m.
Outside seating is available. “Sunday best” attire is suggested.